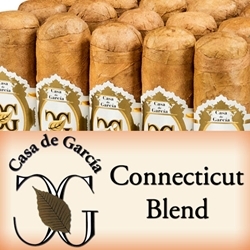 Crafted in the Dominican Republic, Casa de Garcia Connecticut Blend are hand-rolled premium cigars uniquely created with an aged blend of Honduran and Dominican long filler tobaccos, a smooth Connecticut binder and a light brown Connecticut shade wrapper. From beginning to end, Casa de Garcia Connecticut premium cigars offer a consistent smooth, mellow and flavorful smoking experience to every user that tries one of these excellent hand-made cigars. Casa de Garcia Connecticut cigars can be delivered right to your doorstep! Smokers Discounts has made it easy and affordable to buy premium hand rolled cigars online. A variety of sizes and flavors are listed below in our online cigar store. Each of these styles are in stock and available for a low discount price! Call us for more details!